692-acre Lake Naconiche gives East Texans yet another option for fishing, swimming, water sports and scuba diving. 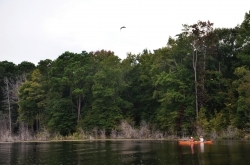 Initially stocked with thousands of largemouth bass from the ShareLunker program, Lake Naconiche is also home to spotted bass, channel and blue catfish, black and white crappie and bluegill. Recreational facilities also include accessible fishing piers, a swimming area and a scuba platform. Click here for Parks and Wildlife info.